Game New Super Mario Bros.
World 8-8 is the tenth level of World 8 in New Super Mario Bros.. It becomes accessible after completing World 8-7. It is the last normal level of the game. This is an overworld level, featuring Volcanic debris raining down from the sky every few seconds, and Kab-ombs trying to chase after the player. The level begins on flat ground, with the volcanoes in the background erupting and debris beginning to rain down almost immediately. 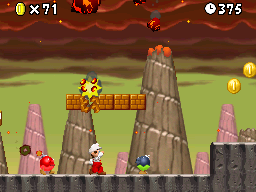 There are some Stone Blocks in the area that the debris will break through, and Kab-ombs that will light up and chase after the player after coming in contact with debris (or with a fireball from Fire Mario). This sort of expanse continues within the level until the checkpoint is reached, with occasional gaps in between. Just before the checkpoint is a one-way platform with a Mini Warp Pipe underneath; there is a Hidden Block containing a Super Star located here. After the checkpoint, there are some gaps with Stone Blocks covering them. The ground steadily rises until it reaches a row of nothing but Stone Blocks; with the debris breaking the blocks and the multiple Kab-ombs in the area, this section is rather hazardous. After making it through the row of Stone Blocks, the flagpole will be reached, allowing the players to access the second-to-last level of the game. Star Coin 1: The first Star Coin can be found at the very beginning of the level; near the top of the screen, on top of a platform connected to another platform through Stone Blocks. Star Coin 2: A Mini Mushroom is required for this coin. At the checkpoint is another Mini Warp Pipe, this time underneath Stone Blocks. The player should debris break through the Stone Blocks, then enter the pipe. The player should get through the maze inside, where the Star Coin can be found in the center, and they exit through the first Mini Warp Pipe found earlier in the level. Star Coin 3: The third Star Coin can be found shortly after the checkpoint; the coin is surrounded by Coin Blocks, so the player must let debris break through the blocks in order to obtain it.